As mentioned the geographic Lay out of the Confucian Complex has a symbolic significance. The Temple complex has a square form representing "Earth". 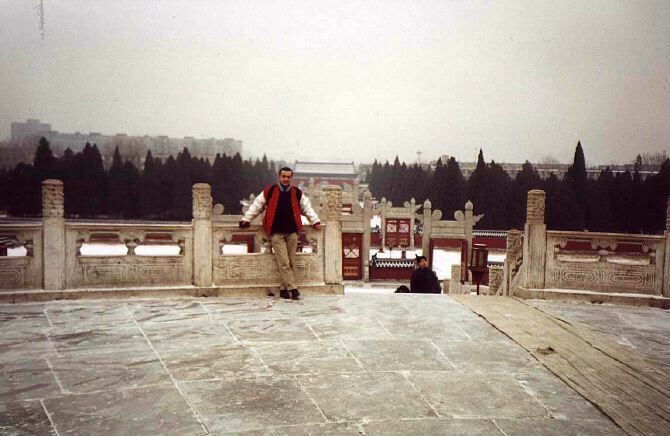 Only the North Edge of the complex , facing the TiananMen and Forbidden City is a Half Circle. The circle symbolizing "Heaven" (The Sun). 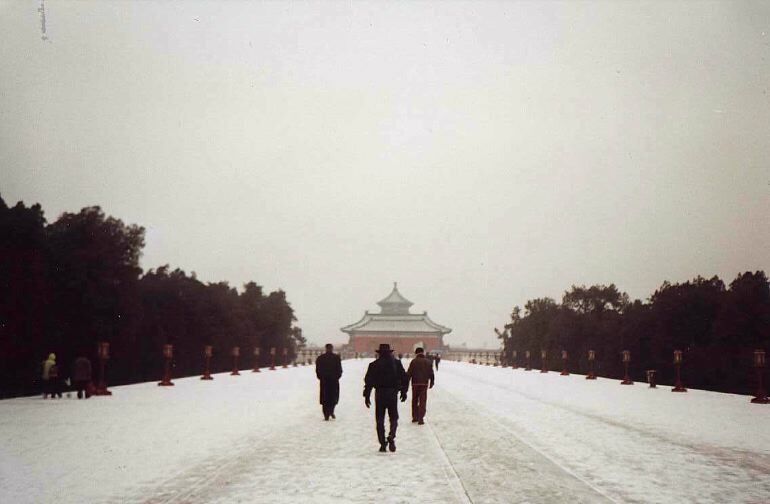 Passing through the Temple from the Square into the Half Circle on his way from the South Gate to the Hall of Prayer for Good Harvests (via the Central Line ) hence symbolized the passing of the Emperor from Earth into Heaven. On his way along the long central axis of the Temple, the Emperor would stop off at the various holy altars to perform the necessary rites and prayers and gather divinity necessary to enable him to communicate with "God / Heaven". Rituals depended on the occassion for visit. The Imperial Vault of Heaven has been modelled after the Larger and Older Hall of Prayer for Good Harvest , the most important Temple Vault, as mentioned. Built around the same time as the "Round Altar" , the Vault of Heaven is surrounded by the "Echo Wall". Details from the top of the Imperial Vaults doorway. Golden Dragons of course symbolise the Emperor, his Power, his Wisdom and Longevity (of the Dynasty). 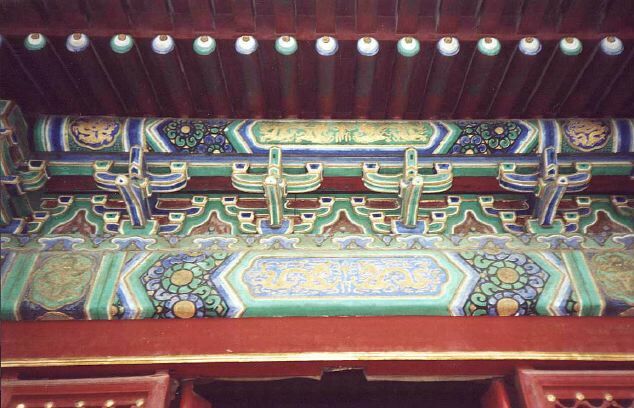 This type of classical Ming religious architecture and art can be found on monuments around Beijing City. Tiantan Park (Tiantan Gongyuan) is the home what is popularly known as the Temple of Heaven, in proper terms the Hall of Prayer for Good Harvests, which next to the Great Wall of China and the (in)famous Gate of Heavenly Peace (TiananMen) ranks as one of the most iconic landmarks of classical Beijing. A visit to the larger park of the Temple of Heaven therefor is one of the main things to do when arriving in the city for a first time of sightseeing. dominates the South-side of Tiantan Complex. In the Snow at the Bridge of Vermillion. This very long marble walkway leads up to the Hall of Prayers for Good Harvests. To the West are the Park, the Hall of Fasting and more to The South the Imperial Musical Administration, the latter not originally present. Next up is the Wall of the Imperial Vault of Heaven, a Hall enclosed by a massive and impressive wall with three heavy gates. This is not the Main Temple Hall - Tiantan, yet. The Tiantan or more precisely: the Hall of Prayer for Good Harvests at the Heavenly Temple Complex ( Tiantan Park ) stands more to the North along this central route at the precise center of the Park. Its roof can be seen after one walks around the Imperial Vault enclosure wall. It is at the Tiantan , or Hall of Prayer where the Symbolic and Spiritual Center of the Chinese Empire was deemed to be located for they believed the Center of Heaven itself was located exactly above the Altar of the TianTan and its encased Dragon Stone. However, on different occasions of the Lunar Calendar the Emperor would communicate with the Heavens and their Powers through the adjacent (South) Round Altar of Heaven. The Tablets of the Gods and other Holy Relics needed in the ritual were safely stored inside this huge vault. Hence it is the Imperial Vault of Heaven. Hence, soon after the disastrous event in 1889 AD, regardless the empty coffers of the State, in order to prevent a possible political upheaval that might put a final end to the Manchu Qing Dynasty , the important Imperial Hall of Prayers for Good Harvest was restored to its original state at considerable cost. 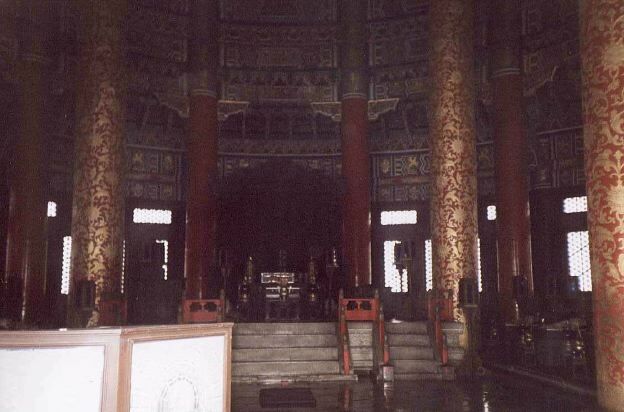 Although nearing the end and after the fall of the Qing Dynasty the Temple and its altars fell into disrepair, the Temple retained enough of its powers to later see the traitor General of the Qing Dynasty make his own attempts to claim the Mandate of Heaven (to rule the Chinese Nation). The General failed miserably in his attempts and died soon after, being despised for his double treachery to this day. 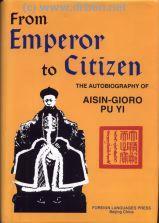 The last person to pray at the Altars in fact, was the famed and notorious Last Emperor, Aisin Gioro Pu Yi. Today, in a modern Peoples Republic of China, the Temple of Heaven has once again been made a central icon of Chinese National Pride and Cultural awareness. During the all important opening ceremonies of the Beijing Olympic Games, there was a ceremony held at the Hall of Prayer of Good Harvest, as part of the larger, much Feng Shui inspired, opening ceremonies for these Olympic Games. At the time, the altars and magicl lay out of the ancient city, once more came alive as spiritual centers of the Chinese Nation, but also State. The Hall of Prayer for Good Harvests, or TianTan as it is usually called , carries very deeply blue shaded Tiles on its roofing , representing the Heavens. The rounded Altar , below the 38 meter high dome of the Temple was considered the Centre of the Chinese Universe and a sacred Site. This was literally the place where the Emperor could communicate with the Heavens that gave him his mandate to reign over the Chinese People. TianTan or Hall of Prayer for Good Harvests was originally built in the year 1420 AD, during the Yongle Reign of the Ming Dynasty, after which only the surroundings of the Temple underwent changes. The Temple of Heaven Park was one of the first and main structures of the city to be designed in- and built when the Great new Capital of the Yongle Emperor of the Ming Dynasty took shape in the early decades of the 15th century. With the Ming Dynasty Capital removed from southern Nanjing an entirely new city could be conceived of, its design as perfectly alligned with the principals of Geomancy (Feng Shui) as possible. Within this large structure which encompassed the entire city, the Temple of Heaven complex was one of the larger Temples of Imperial Stature, dedicated to the upkeep of communications with the heavens and the knowledge of heavenly phenomena. 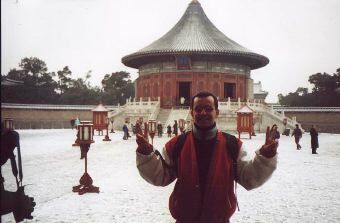 Although, there were many additional additional Temples with a high Imperial Function in the city and also within the confines of the (larger) Imperial Palace (such as the Square Altar at Zhongshan Park), in history and by design the Temple of Heaven was the highest and most imported Temple of all. To be more specific, although the adjacent Temple and Altar of Agriculture (and Grain) and also the Temple of The Sun (Today: Ritan Park) and Temple of the Earth (Today: Ditan Park) had their functions, inside the Temple Of Heaven complex one may find the main altars used for communications with the Heavens. Altogether, the entire wall enclosed complex covers some 270 hectares and is an A-Level National Treasure consisting of several holy Altars and their subservient pavilions, as well as a fasting palace, a rose garden and various other spots of interest. 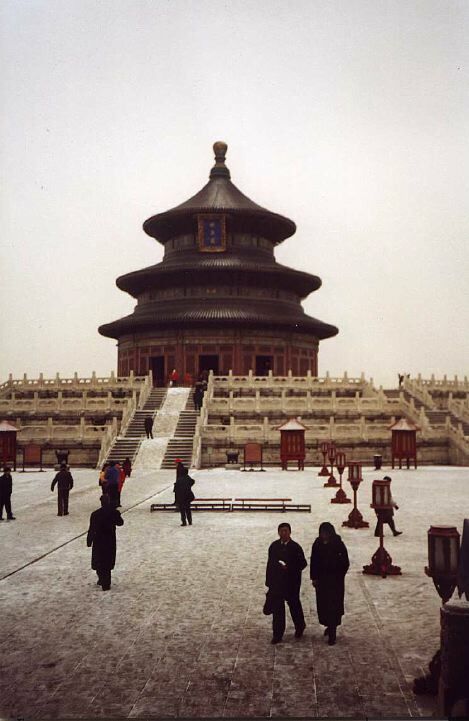 The Temple of Heaven was first opened to the public in the year 1918, during the years of the First Republic of China. Due to its unique architecture, and great status as a national historic and cultural relic the Temple of Heaven was given a UNESCO World Heritage Site status in the year 1998. As an Imperial Holy Shrine of the Highest Order , the Temple was completely off-limits to the Public. Now, the still enclosed Temple Complex (as seen in the distance) can be entered and viewed for an admission fee and nearly all of the park is open to the public as a very-pleasant-to-be-in public recreational space. 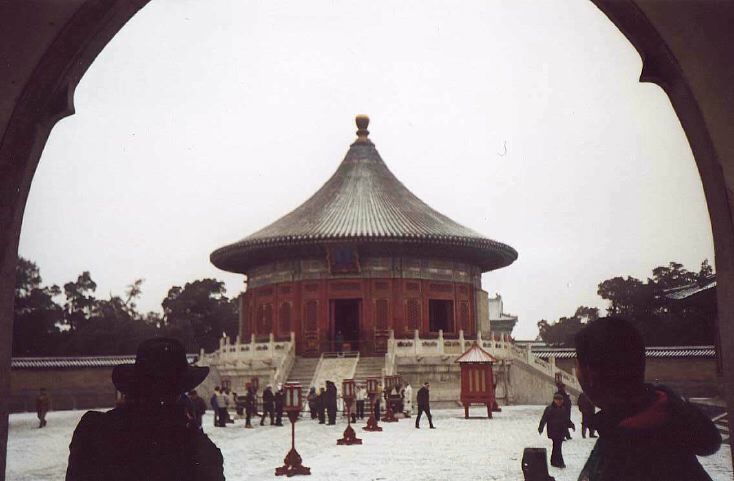 As one may find in this brief tour and introduction, the first, the oldest and southernmost of these powerful geomantic altars found at the Temple of Heaven is the round or circular altar. The secondary altar, which later gained enormous importance may find inside the much praised Hall of Prayer for Good Harvests. The first is an open air circular open altar whereas the second is an most holy stone fitted atop an altar which itself is seated within the Hall of Prayer for Good Harvest which itself is placed atop a white marble altar and is enclosed by its own circular wall with access gates. The Tiantan is a fine example of religious Architecture from the Ming Dynasty, together with other Imperial relics in Beijing among the great relics of classical Chinese architecture. Although it is a Temple, it is also a Park and Garden in which the Emperor could be secluded safely for several days in order to prepare himself for the most important ritual event of the year. This event, the most important date on the Imperial Calendar as far as ritual was concerned, would take place only once a year, around the time of the winter solstice. At the time of the first light of day emerging and touching the (round) altar on the first day of the winter solstice, the Emperor was expected to "pray" and rise up to the top of the altar in order to be in direct communications with the universal powers of the heavens. However, before all of this was possible, a number of ritual steps had to be gone through. The first step of the Imperial ritual was the departure from the Forbidden City as proscribed through the eastern gate. Following a preplanned route which was cleared from any of the passing public (no one was allowed to look at the Emperor and all windows looking out on the street would be ordered shuttered), the Imperial parade then made its way to the ceremonial southern gate of the complex, which was then available as entrance. Once having passed through the gate, the Emperor was to descend from his sedan, and as with visitors today, to start his tour of the complex. Although in reality the whole procedure was far more complex, among things, the next function was for the Emperor and his following to start the steps of purification. For this reason, there is large "Fasting Palace" to be found in the western parts of the park. Having gone through his initial ritual of seclusion and fasting, on the final morning the Emperor would take on his final ceremonial attire, before heading along the main axis of the Temple for the ceremonies to praise the heavens at the various altars. (Full Information in the Full Tiantan Park Report)! The stairs of the Altar and the slabs of the upper Platform Circle reveal some interesting ones for you to ponder over. Take the 12 times 12 white marble stairs, together making the number 144 also known from Christianity and the Mayan Holy Book. Entrance to the Wall-Enclosed Imperial Vault of Heaven on a lovely snowy day with few visitors. The HianQiuTan or Rounded Altar designed in 1530 AD, is Famous for its Peculiarly Good acoustics. Among things, the architecture of marble tiling and balustrades will amplify any sound made at the Centre of the Altar. Twice a Year , a beautifully outfitted and adorned Parade of Eunuchs , Dignitaries and Ministers would leave The Imperial Palace , parade through The Imperial City eastward and head for the more southernly Tiantan , passing the Impressive City Walls via the South-East Gate. The Emperor would return on the 15 day of the 1st month of the Year (Chinese Lunar !) to Beg the Gods to bless the Harvests in the coming Season at the Hall of Prayer for Good Harvests. The Hall of Prayers is 38 Meters high and was built without using Nails. Not a single One. 4 Red Inner Pillars surround the Altar symbolising the 4 seasons. Outside of these stand 12 pillars to symbolize the months of the Chinese Lunar Year. The Outer Wall of the Temple Hall is constructed of yet 12 more pillars to represent the days 12 hours. The the Outer Wall is formed out of panneling between these 12 Outer Pillars , 26 panels representing the parts or "Watches" in a Day. The Center-piece of the Temple is the Dragon-and-Phoenix stone, which is the Square Black slab in front of the Altar. After having visited the main Hall of Prayers for Good Harvest, tour groups are usually spirited away to the north-eastern side entrance, in the process being led along the long covered wooden walkway which - alike the one at the (new) Summer Palace (Yiheyuan) - is named Chang Lang. The Chang Lang is situated immediately to the east of the Great Hall of the Temple of Heaven and as one may find, this long covered corridor iwith view of the holy most ancient Chinese Temple Hall is one of the most popular locations for locals to pass the time. Among things, they play traditional Chinese instruments, sing together, or just play the ancient Chinese game of mahyong while catching up on the latest gossip and news bits. At times, for this reason, the long corridor can be among the most crowded and lively locations in the park. While quick tour visitors are led away from the Hall of Prayers for Good Harvests, the blue tiling of this large Central Hall can be seen in full glory a last time when walking east in order to leave the Complex. Others, who have the option to loiter about for a longer period, can rejoice in exploring more of the park. A fine place to visit is the one structure of the central axis not included in the traditional quick tour of the Temple of Heaven. Unbeknown to many, there is an additionall hall to be found behind and to the north of the enclosure of the Hall of Prayer for Good Harvests. This temple hall was intented for the storing of ritual Confucian tablets which were used in the sacred rituals of the Temple. As one may find, fine Gardens surround the entire Temple as the Park extends to the West Gate, East Gate and North Gate. The fun thing to do inside the walled enclosure is to try click your fingers and see if you hear the echo. As you can see .. eventhough the enclosure is quite big and others move about, still sounds are carried across. It was here that the Emperor performed Buddhist rites for the Ceremony of the Winter Solstice. Extensive Tablets on the Imperial Ancestry used in the Buddhist-Sjamanist astrological Ceremony were stored inside the Temple as sacred relics, making this a sacred site in ancient Times. The importance of the building is highlighted by placing it on a Platform of white marble. Imperial Stone Carved Dragons on Marble Slabs surround the Imperial Vault on its Platform. at the Palace Museum (Gugong) , and in other places. Please do not touch or damage when visiting! This is the original artwork dating back 100's of years and irreplacable. Also twice a year the Emperor would leave the Imperial Palace through the West Gate. From there he would proceed first to ZhaiGong or Palace of Abstinence. In this Palace he would spend a Night of Ceremonial Fasting and Abstinence (quite unusual for an Emperor). The massive Symbolic 4 inner pillars surrounding the Altar of Heaven are cut from a single Tree. The only trees big enough to replace the old have had to be imported from Oregon in the United States and are Oregon Fir. In 1889 such large tries had already been lost to China. Once again sound-tricks are played on the visitor. When the courtyard is not too crowded, a soft noise made on one side of the courtyard can be easily made out by someone on the other side. The Altar is this Time a circle within a Circle. A "Heaven within Heaven". Find Tiantan Park in the South of Chongwen District, full detailed map + links. Inside Tiantan Park's South Entrance, with a view of the Peculiar Round Altar, a circle symbolizing "Heaven" or the Sun. Atop the Round Altar, a circle symbolizing "Heaven" or the Sun. The entire altar is "Secretely" encoded with numbers. For instance - there are 9 circles of granite slabs around the Central Echo Stone, of which the inner circle is again made of 9 granite slabs. 9 is the number of the Monkey (King=God) and 9 x 9 makes 81, which is the number of Immortality, as featured in the Chinese Classic Book Journey to The West. The stairs of the altar encodes other esotheric numbers. View from the Top of the Round Altar to the South. In the snowy distance highrises of the suburban eastern-Fengtai district. Ceramic roof-tiles of the Imperial Vault rising above the Vault Gate. Inside the Walls surrounding the Imperial Vault of Heaven. Front View of the Imperial Vault of Heaven before restau-rations in 2005 . Traditional Decorations with Imperial Themes above the Central Doorway. 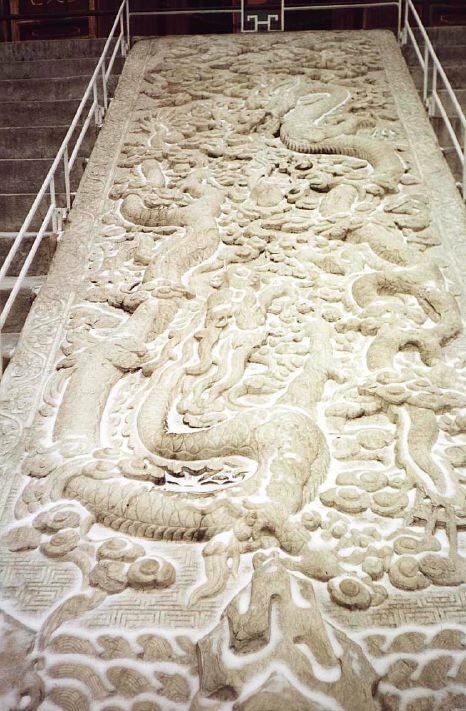 Large Granite Slab with Double Imperial Dragons whirling in Clouds around a Central Pearl or depiction of the Earth. Slabs are similar to those found at The Main Halls of the Imperial Palace (Forbidden City. On the Bridge of Vermillion, a great spot for an souvenir Photo of Tiantan Park. A Look through the Gate of Vermillion at Hall of Prayer for Good Harvests. Overview of the Hall of Prayer for Good Harvests on it's 3-high circular white marble Platform inside a circular Courtyard of Heaven. The Chang Lang or long covered wooden walkway running East from Hall of Prayer for Good Harvests and walled enclosure. 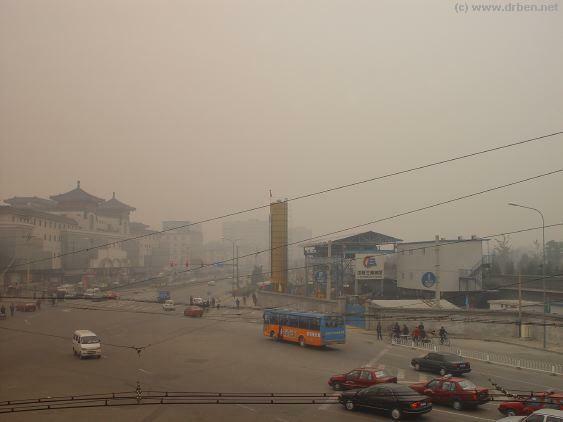 Although there no doubt are many, this is one of the great sights of the Park and the City of Beijing. Tragically , the original building was destroyed by Fire in the fateful Year 1889 AD during the reign of Emperor GuangXu of the Qing Dynasty, while China was bending backwards under Foreign pressure while inside, liberal idea✧s and mutinous talk were rife throughout the Nation. At the time, while the real powers of a still juvenile Emperor were very much in question, the burning of the Hall was widely considered a very bad omen by many. The loss of the incredibly important shrine which legitimated the Mandate of Heaven was an incredible loss to the Nation and another political shock for the Qing Dynasty. 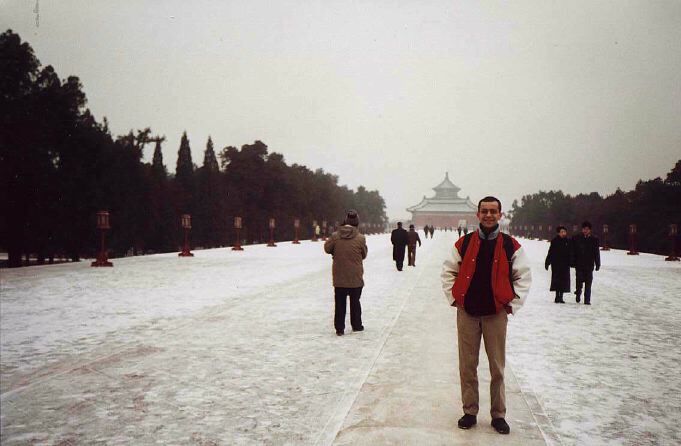 Before the turn into the new millennium transportation from Tiananmen Square to the Temple of Heaven was still rather a venture, with the best and quickest option being to take a taxi there and for more leisure outings it was a popular destination for a bicycle tour. 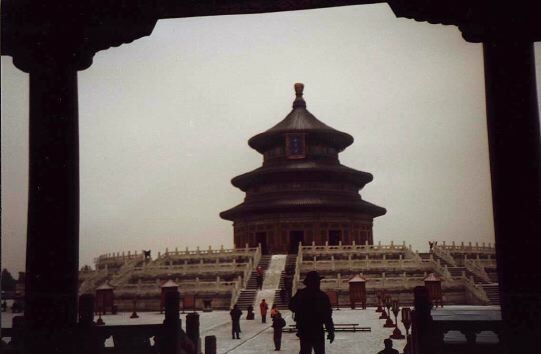 With only 2 metro lines operational in the year 2000, there was no speedy trip to the Temple of Heaven and hence most people would book the official tour, the one that is used as a guideline for the introduction to the park. The good news of the new millennium was that visiting foreign tourists at last could enjoy convenient English language road signs which pointed the way to major tourist sites especially well. Today many years and one magnificent globally celebrated Olympic Games (2008) later, transportation is easy due to the construction of a considerable number of new underground railway lines in Beijing since. 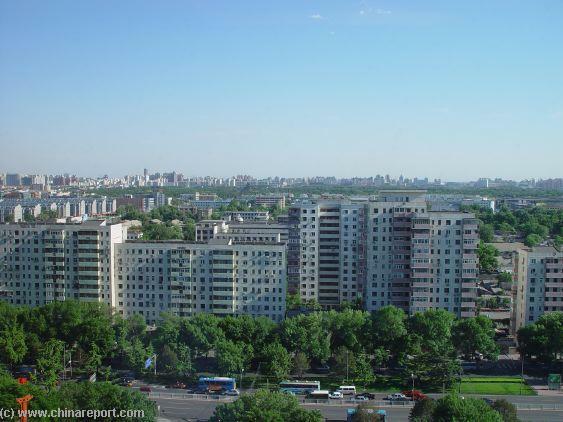 Among things due to the additional needs created by the hosting of the 2008 Olympic Games, a master plan to modernize was created for the city and Beijing began a major overhaul in 2002. 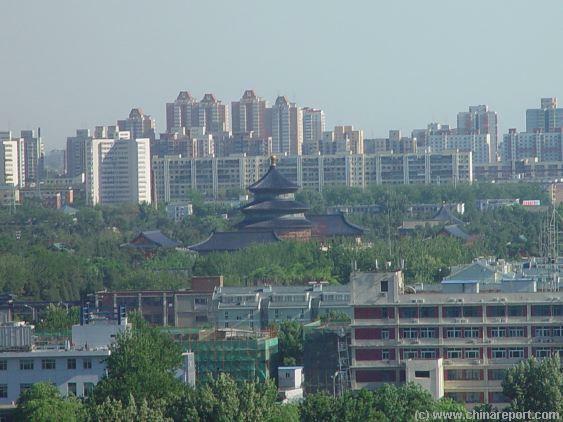 By the year 2005 a new subway station at the east gate of Temple of Heaven was nearing completion, one of the first of many stations to be built throughout the city and suburbs in the decade there after. Men) Station which puts one squarely at the front of the popular tourist Hong Qiao Market, its Mc Donalds franchise and on other side of the large Tiantan East Boulevard, the eastern gate of Temple of Heaven Park. As one may guess, today most foreign visitors check in through the east gate, however it must be noted that is not the correct gate to start with traditionally. The Temple of Heaven East Gate (Tiantan Dongmen) subway station under construction at Tiantan Donglu in November 2005. On the left of the image and road, the Hongqiao (Red Bridge) Market which faces the East Gate of Tiantan Park across the boulevard. Today a fly-over allows pedestrians to cross between the two avoiding the busy traffic below. and altar platforms. In this way, arguably, one has the optimum experience of the most luxury form of the blend of architecture and traditional garden landscaping which so well represents the ancient culture of the feudal eras of the Ming and the Qing Dynasties during which the Temple was active and functional. As one might have expected, naturally the huge park has several more gates in addition to the now popular east gate. A single grey brick and meters tall outer wall connects around through all Gates in order to shape the park and temple enclosure and when you arrive this is probably the first structure you will be confronted with. 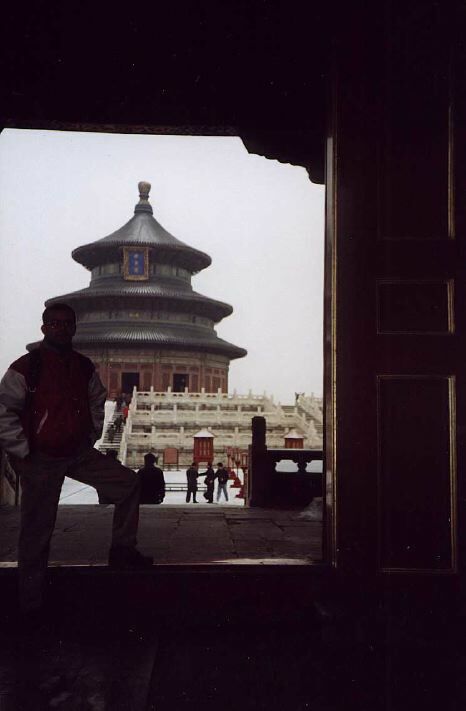 Below is a quick impression of a traditional tour of the Temple of Heaven Park, which in general and by tradition only involves the main structures of the central axis of the park. Scroll down to get a quick impression of all structures and their general meaning, then navigate the park by clicking through to separate pages on each structure within the park for more information, photos and historic details. 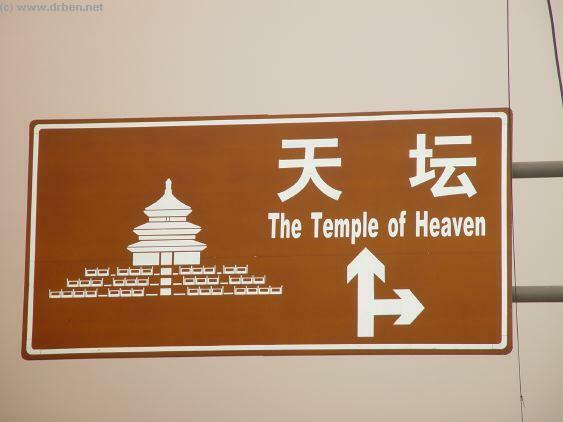 megametropolis of today, the Tiantan -Temple of Heaven- Park, the Tiantan Temple Complex, can easily be found and identified on any map. It is the very large park found in the south bottom of original south-eastern Chongwen District of the Old City. In the past, the border between Chongwen District and the adjacent Xuanwu District was created by the Feng Shui (geomancy) wise all important central axis of the city, along and across which all structures had to be balanced. 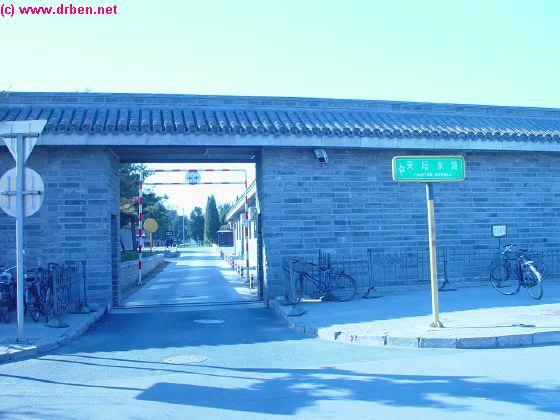 Today, the central axis runs from the southern outermost gate, the Yongdingmen, through Yongdingmen Dajie, Tianqiao Nandajie and via Qianmen Dajie to the Qianmen Gate also known as the Front Gate (of the old walled city). With the latter two locations being important cultural and tourist areas of the central city, most tourist well readily be able to find their way there. The Temple of Heaven Park however is not part of the heart of the city but is found several kilometers to the south, near Yongding Gate (Yongding Men), the southern outer gate of the old city. A view of the main structure of the enclosed Hall of Prayer for Good Harvest at the larger Temple of Heaven complex as seen from the Capital Hotel tower to the north. As was noted above, traditionally, the southern gate is the ceremonial place of entrance and this is thus where a traditional tour of the park takes off. Unfortunately, even today with much improved city transport, the southern gate is also usually the most difficult to reach. To get there speedily and conveniently, have a taxi drive you the gate. 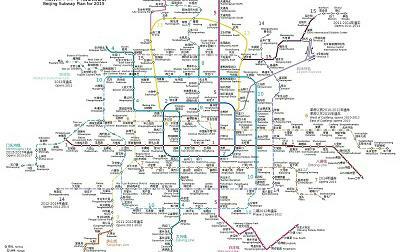 A secondary more fun option is to travel by subway to the Yongdingmen Station. From there one may first explore the (rebuilt) Yongding Gate, which used to be the south outermost gate of the Walled City in the Qing Dynasty. The old city walls were torn down decades ago, but the Yongding Gate has been rebuilt in 2005 as a reminder of the glories of the ancient city. In addition one can explore remnants of the former city moat as well. 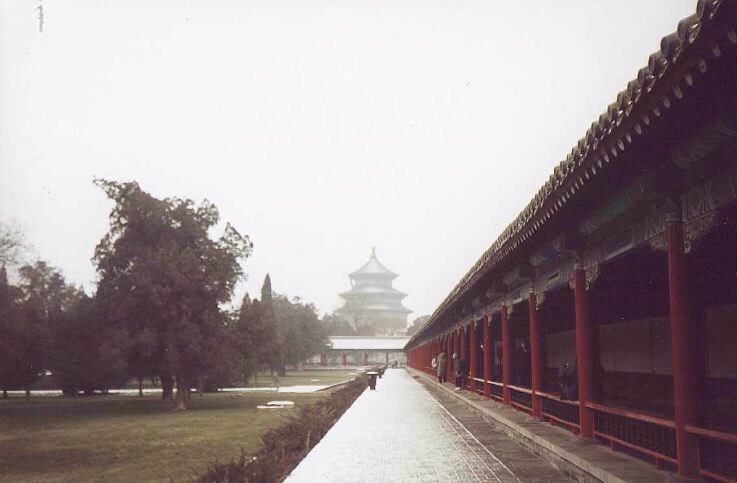 The outer enclosure wall of the Temple is not crimson red chalked as that of the Palace Museum (Forbidden City), instead it is a fairly regular looking greay brick wall which however has its own roof and ceramic tiles to signify its high significance. The blue ceramic tiles classify the building as an Imperial Temple. may still find some last remains of this now lost Imperial Temple within the grounds of the sports park. 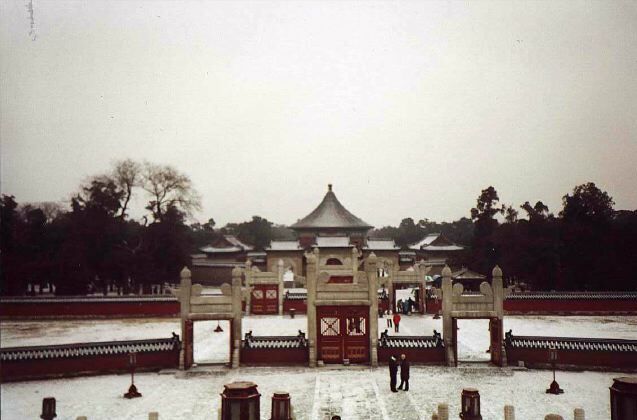 Among things, there is an outer gate identical to those of the Temple of Heaven Park and there are memorabilia of the agriculture temple and altar as well. The third most popular gate of the Temple of Heaven Park is found along the east side of Yongdingmen Street. This is of course the western gate (Xi Men) which is easily accessible for traffic (bus and taxi dropping groups off) and leads directly into the green and more hidden parts of the Park. As you may find this gate is popular with school student groups and party societies to be dropped of for an educational visit to the park. 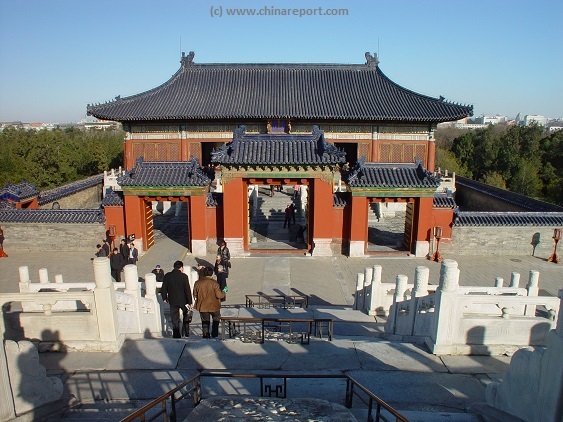 Last but not least there is the northern gate (Bei Men), which is the ending point of a traditional tour. Through the north gate one has the quickest and easiest access to the actual Hall of Prayer for Good Harvest, which is the main iconic building of the park. For a better understanding of the general location of Park and the other landmarks to visit in its surroundings, please refer to adjacent overview map of Temple of Heaven and area. The map includes all entrance roads and in addition holds the location of each separate structure of importance within the park. Apart for the structures described in brief below, there are important structures to be found off the central axis of this originally geomantically balanced Temple Park. Study the park and area to select your route there. Navigate each structure by clicking on locations to find additional information and photos. Scroll on down on this page to have a brief introduction to each main structure along the central axis of Temple of Heaven Park. Although one may not easily distinguish it in the adjacent available photo, the dressing platform is exactly that, a platform set aside of the main road leading to the oldest altar, which is the round altar of heaven the outer Linxing spiritual gates of which may be seen beyond in the distance. route and ritual followed by Emperor and entourage, the dressing platform is the first and southernmost structure of importance within the gates of the park. Its general location is also the first distribution point for traffic within the confines of the park. Although the main direction is north along the central ais to the various altars, visitors can also turn left (west) or right (east) in order to find lots of greenery and more hidden structures of the park. Nation. It was one of most important of the Emperor's many Duties. 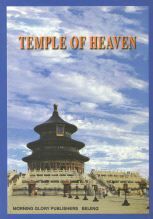 In case, the Temple of Heaven did not so much serve a spritual need, but its main function was to allow the Emperor, and him only, to communicate with the powers Heaven, which afterall, according to Chinese traditional beliefs, had bestowed the "Mandate of Heaven", the cosmic power to rule all of the earthly realm, upon him. Since this was the case, in order to fulfil his tasks properly and keep the Empire running, it was believed the Emperor had to make sacrifice at the various altars regularly. In addition, the Emperor - through his infinite wisdom and close relations with the heavens was expected to produce and accurate calendar yearly, so that the farmers of the larger realm might know when to sow, work and eventually harvest succesfully. If the procedure was not completed or not followed as stipulated, farmers might see their crops fail across the Nation, in which case the Emperor would have t count on social unrest, unwanted migrations, and worse; banditry and ultimately the terror of a peasant uprising. 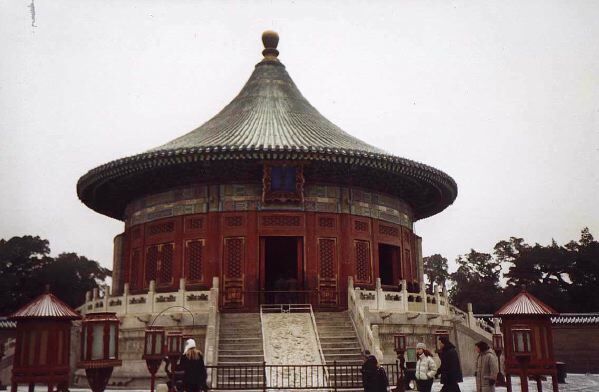 The last important ceremonial building of the Central Axis of the Temple of Heaven usually remains unnoticed by those who take the quick tour of the Temple of Heaven. This is the Hall where the Confucian Tablets involved in the rituals were kept throughout the year while no ceremonies were ongoing. View of the greenery of Temple of Heaven Park from the Capital Hotel Tower in the former legations quarter of the old city in the south of the adjacent Dongcheng District. 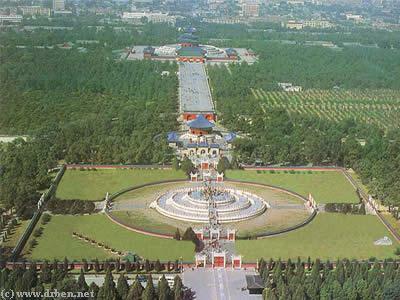 Rose Garden with its Double-Eaved Pavilion, 100 flower pavilion or also the fairly large Fasting Palace, a crucial ceremonial Palace for the Emperor within the Temple Park. Other locations of interest are strewn throughout the park some of them ruined by invading armies at the dawn of the 20th century.